Using a damp sponge apply white paint around the middle of the face, starting from above the eyebrows and down to the top of the lip, avoiding the eye area. Using a brush and the white paint create a fur effect around the outside of the face. 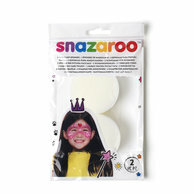 Using a damp sponge carefully dab black paint around each eye area creating black circles. 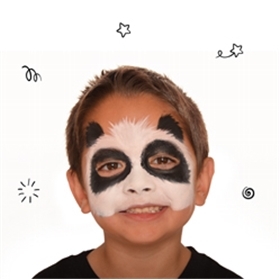 With a brush, paint black ears on either side of the face. Use the same technique as in step 1 to create a fur effect around the eyes and ears. Using a brush outline the face with black paint. 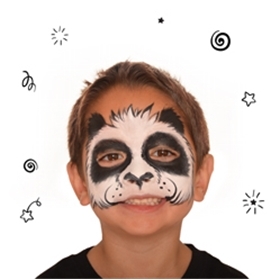 Outline the nose with zigzag lines and paint black above each nostril leading to a point above the lip. 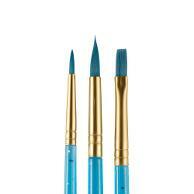 Paint a curved line from the corner of the lips leading to the nose and add dots with the tip of the brush. Not suitable around the eyes and lips.